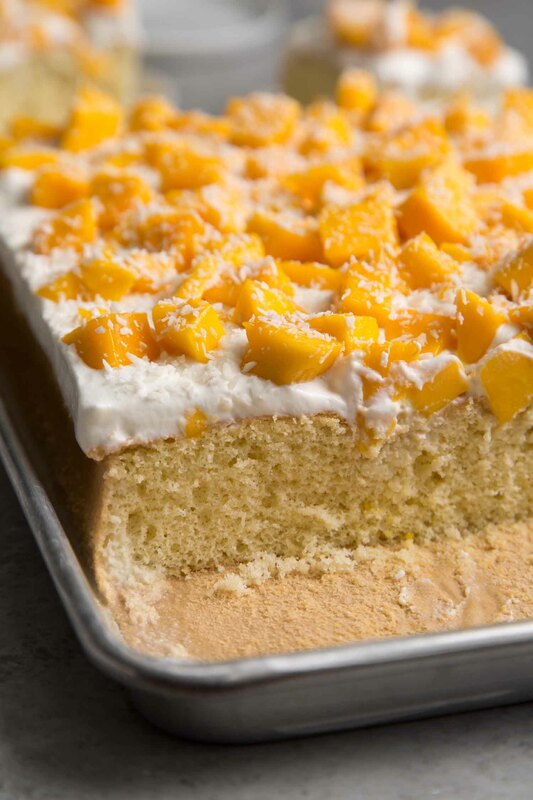 Enjoy a taste of the tropics with this mango coconut sheet cake. 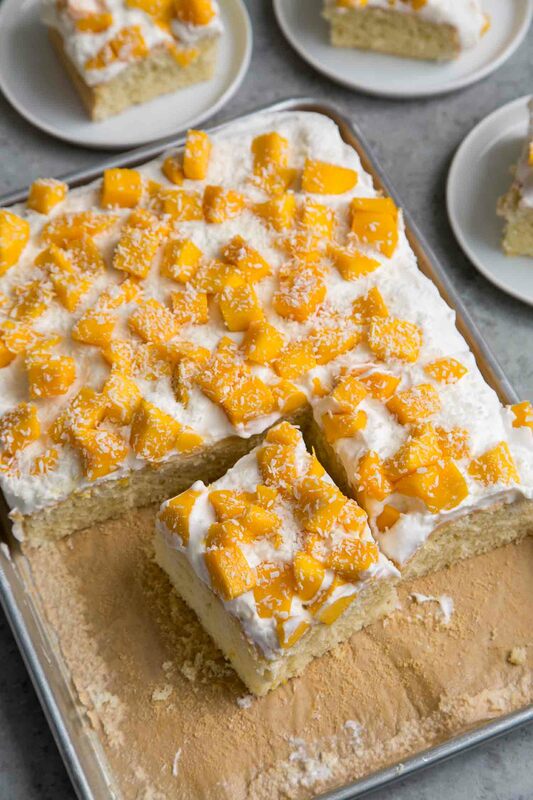 Vanilla sponge cake is soaked with coconut milk and topped with fresh mango and dried shredded coconut. I’m on a tropical kick this week. 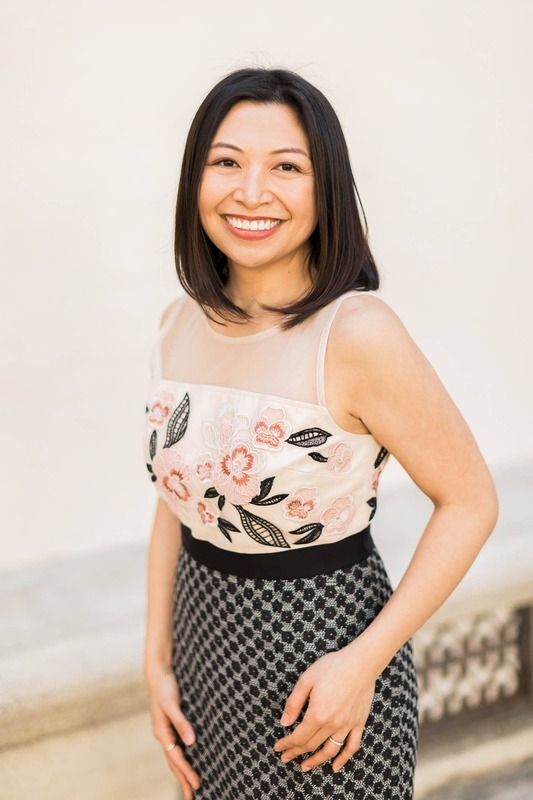 It’s because I’m super excited about my upcoming trip to the Philippines. I haven’t visited in over ten years. The last time I was in Manila was in 2007 for a summer study abroad program during my senior year of college. I’ll be there for a quick week next month to attend a dear friend’s wedding. It’s on a private island… which requires guests to travel by small plane for an hour, car ride for an hour, and finally a boat ride for an hour. IT’S GOING TO BE AN ADVENTURE! Although, I wonder if wifi will work in such a remote area. I’m keeping my fingers crossed! Follow along on Instagram Stories to see my Philippines adventure. And more importantly, laugh at my husband’s reactions to the heat, humidity, and culture shocks of Southeast Asia! 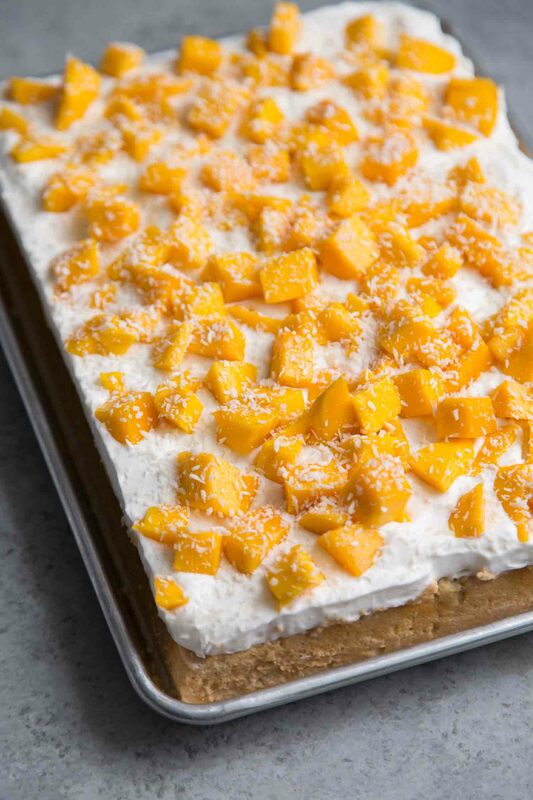 Mango and coconut go together like peanut butter and jelly. It’s a tropical combination of flavors that is pleasant and refreshing. 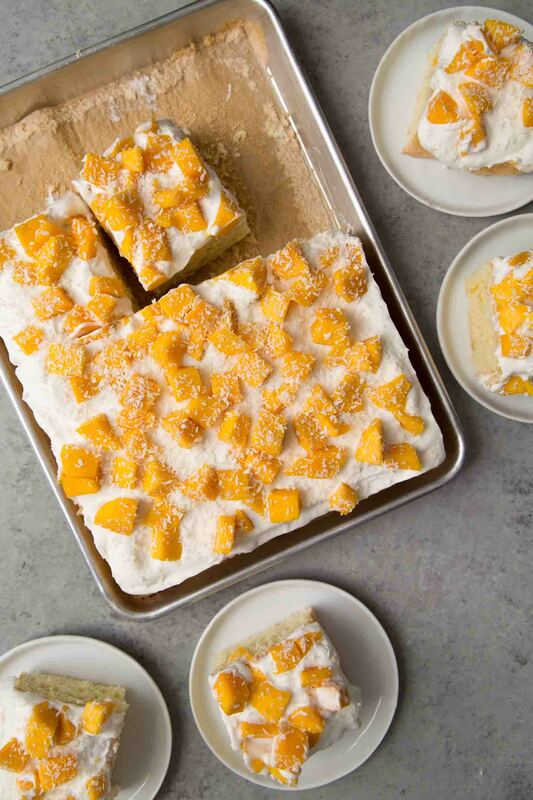 This mango coconut sheet cake reminds me of the sponge cakes from Asian bakeries. Do you know the ones I’m talking about? The coconut milk soaked vanilla sponge cake is topped with sweetened whipped cream. If you’d like to make this cake dairy-free, use whipped coconut cream instead. This cake is quite light and very easy to devour. The cake itself is not very sweet. 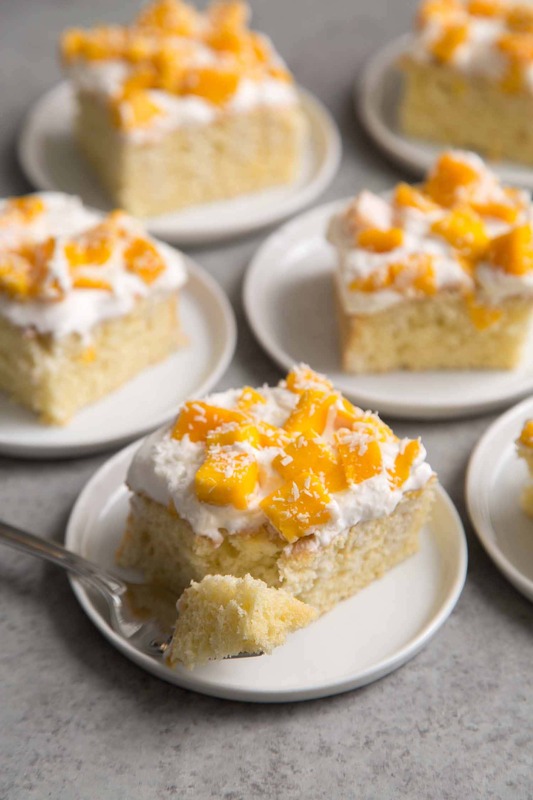 Instead, it relies on the sweetness of the fresh mango and the richness of the coconut milk. How do you make sponge cake? There are various versions of sponge cake. One thing they all have in common: the eggs are separated. The egg whites are whipped to stiff peaks and gradually folded into the rest of the batter. This provides leavening and allows for the fluffy texture of the baked cake. Do not be alarmed by the cake batter. It will be very, very thick before you fold in the egg whites. The batter will loosen and smooth out once all the egg whites have been added. The bake cake will be soft and fluffy, but rather dry inside. Dock the surface of the cake with the tines of fork. Slowly pour the well-shaken coconut milk over the cake in three additions, allowing the cake to absorb the liquid before adding more. Let the coconut soaked cake chill in the fridge for at least 15 minutes. You can make a day ahead and let it chill overnight. 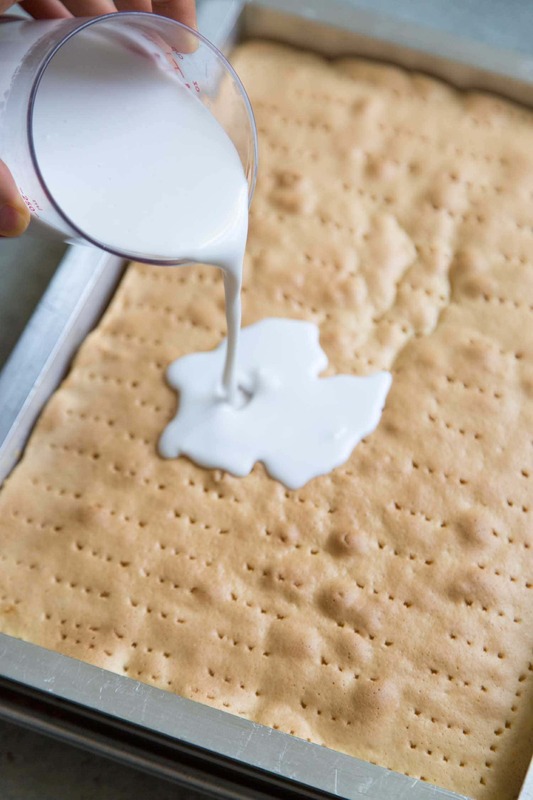 Before serving, spread whipped cream in an even layer over the cake. Distribute fresh mango chunks all over and then generously sprinkle dried unsweetened shredded coconut on top. I used a quarter sheet pan (9×13-inch) with an attached sheet pan extender. The sheet pan extender allows for easy unmolding of cake. Simply lift the extender up and serve the cake in the sheet pan. You can also use rectangular sheet cake pans like this one from Nordic Ware or this one from Calphalon. Alternatively, this cake recipe will also made two 8-inch round cake layers. The vanilla sponge cake is used in this strawberry layer cake. Vanilla sponge cake soaked in coconut milk and topped with fresh mango and dried shredded coconut. Preheat oven to 350 degrees F. Line bottom of 9x13-inch cake pan with parchment paper. Generously grease the sides of pan with butter. Set aside. In a medium bowl, whisk together cake flour, baking powder, salt, and 1/2 cup sugar. In a large bowl, whisk together oil, water, vanilla, and yolks. Add dry mixture to wet mixture in three additions. Fold to combine. The mixture will look like very thick cookie dough. In large bowl, using an electric hand mixer, beat egg whites and cream of tartar at low speed until foamy. Continue to beat a low speed and slowly add remaining 1/2 cup of sugar one tablespoon at a time. Once all the sugar has been added, increase to medium speed and beat to stiff peaks. Add egg whites to cake batter in three additions. Fold to combine. Batter will loosen as you add egg whites. Use a fork to dock the entire top surface of cake. Pour coconut milk over cake in three additions, allowing cake to soak up liquid before adding more. Let soaked cake chill in the fridge for 15 minutes. In a chilled bowl, whip cold heavy cream, confectioners' sugar, and vanilla to almost stiff peaks. Use a stand mixer fitted with a whisk attachment or use a electric hand mixer to speed up the process. Spread whipped cream over chilled cake. Distribute mango chunks over whipped cream. Sprinkle shredded coconut on top. Let chill in the fridge until ready to serve. Use canned full-fat coconut milk. Shake coconut milk before use. Do not use light coconut milk or coconut milk sold in cartons. Those milks will be too thin and will not provide as much flavor. If desired, lightly toast shredded coconut before sprinkling over cake.